Healthy Carrot cake muffins made with less sugar than your average and more tender than any muffin you’ve ever had before! 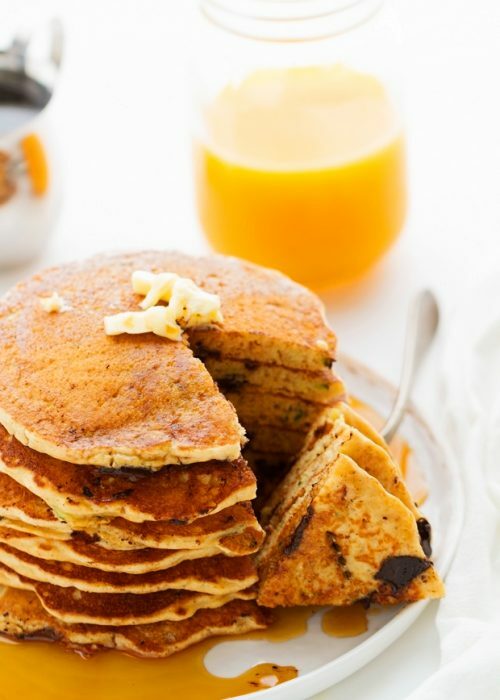 These are also loaded with tons of shredded carrots, coconut, and plump raisins. 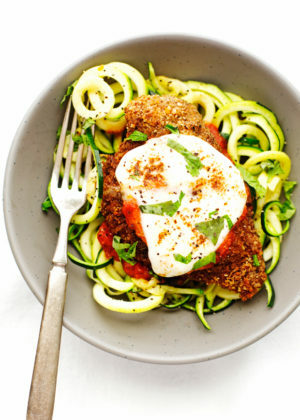 So easy, healthy, and delicious! ORIGINAL RECIPE POSTED JAN. 20TH, 2014. UPDATED ON APR. 5TH, 2017 WITH NEW PICTURES AND MINOR RECIPE ADJUSTMENTS. HEALTHY carrot cake muffins! ? If I was ever forced to choose between a bagel or a muffin, first of all, that would be a major life decision, and secondly, i’d jump for the muffin. Can you tell i’ve given this a lot of thought? Don’t get me wrong. I have nothing against bagels. In fact, I heart them to the maxxx. Especially the sesame ones with a swirl of veggie schmear on it when it’s all toasty. Ohh yeahhhh, baby. Wait, weren’t we suppose to be talking about muffins? Just give me all the carbs, will ya? 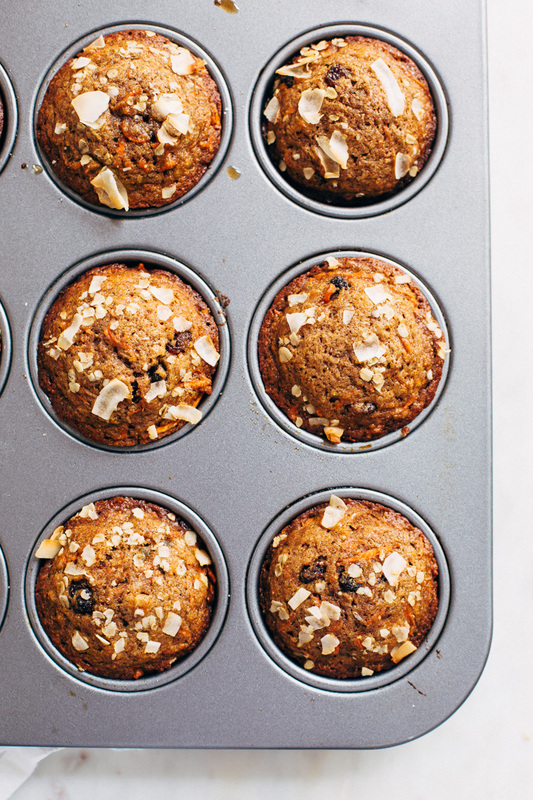 But muffins like these healthy carrot cake muffins have a special place in my heart. Especially for breakfast. Am I the only one that rolls out of bed and wants something sweet to wake up my tastebuds? My husband is completely the opposite. He won’t even think about anything sweet until he’s had his ‘real’ also known as savory breakfast + coffee. And then he’ll proceed to ‘breakfast dessert’ as he calls it. He’s so kooky and I absolutely adore him. There’s just something about a warm muffin. The sweet scent of bread. The way the heat radiates out of the paper lining. I’m easy to please; I’d take one that came in almost any flavor. Be it chocolate, lemon, blueberry, or banana. Thank goodness I’ve never been forced to make such absurd decisions. It’s been 3 years since I originally posted this recipe and it was time we updated the pictures. It worked out quite well as I always make these muffins in springtime around Easter. I’m calling them ‘healthy carrot cake muffins’ because they’re made with half whole wheat flour and less sugar than traditional muffins. And friends, when I say these muffins are SUPER MOIST I mean it. I know, I know that word. But really, wait until you crack one open and take your first bite. They’re soft, fluffy and not a dry crumb in sight. 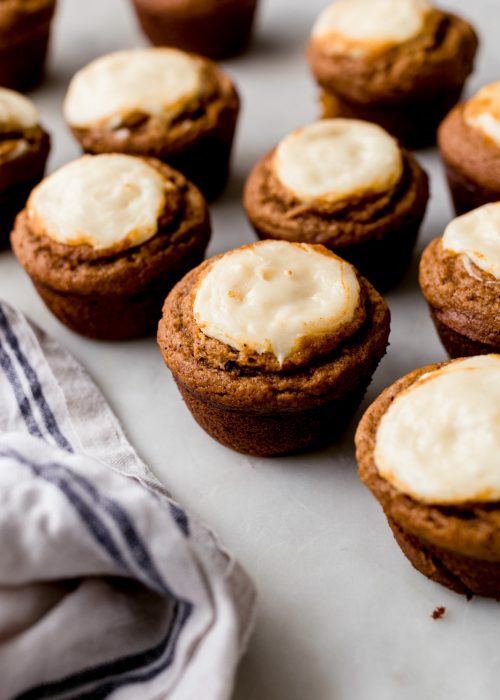 These carrot cake muffins are absolutely perfect. Straight forward and super simple too. A whole heck of a lot better than the stale coffee shop version, perfect! And I don’t say things are perfect that often. <— toooootally not true. Ahem, needless to say I devoured a muffin while typing this (no really, I did). I wouldn’t be surprised if I found a few crumbs around the keyboard later. What I love most about these muffins is that you don’t have to use mixing equipment to make them. Sometimes you just want to grab a whisk and do it the old fashioned way while you’re standing there lost in thought or in my case binge listening to podcasts. Is that a thing, binge listening? 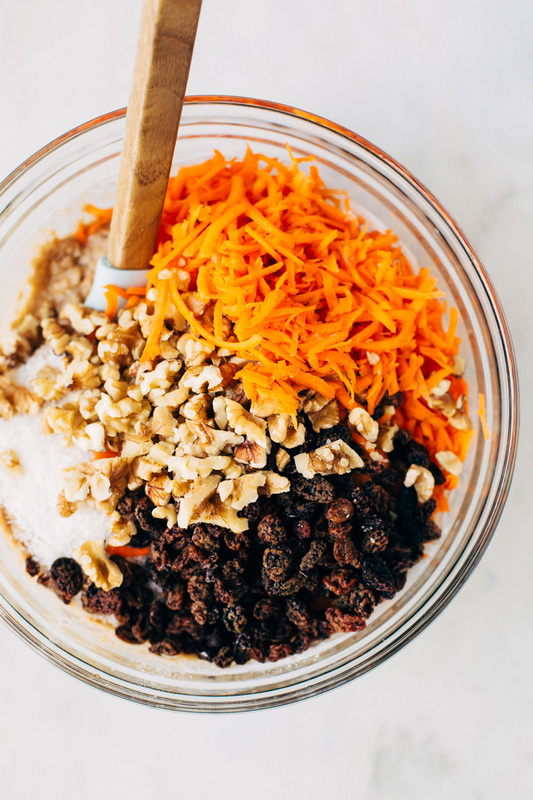 Here’s a given, the carrots are the star of the show but then we use plump raisins, crunchy walnuts, and shredded coconut to add lots more flavor. One thing I love doing is sprinkling a handful of rolled oats on the bottom of my muffin pan before pouring in the muffin batter and then topping the batter with another pinch of oats. This provides a nice added crunch to the muffins plus it makes the tops look so much prettier, dontcha think? 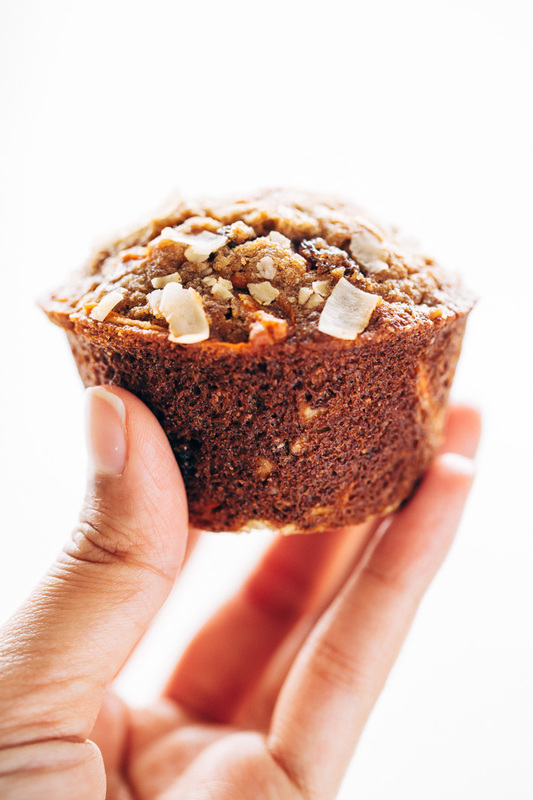 As with most of my muffin recipes, I like to use coconut oil for these carrot cake muffins. Vegetable or canola oil will work as well but I find that the natural sweetness of coconut oil lends so much flavor to muffins. Have you tried coconut oil in baked goods? I swear by it. You can feel good about serving your family and friends these because we’re using ingredients like unsweetened apple sauce and greek yogurt. 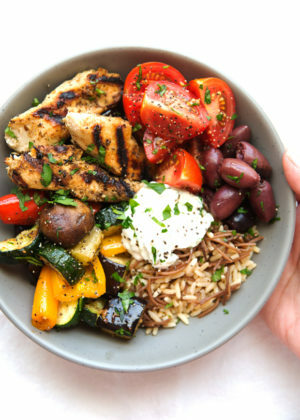 Greek yogurt can be replaced with sour cream or even mayo if you want them to have that nice buttery richness, but I always just stick with my 0% fat greek yogurt to make these healthier. 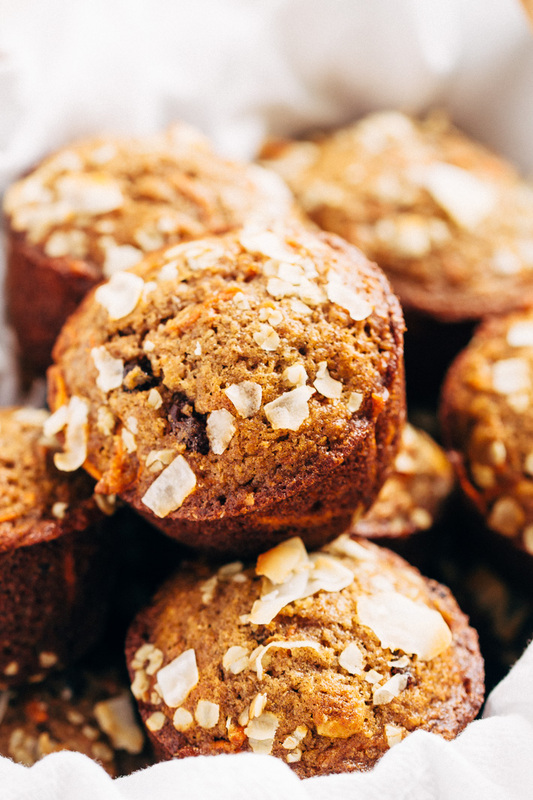 The apple sauce helps reduce the amount of sugar we add in these muffins and that’s ALWAYS a good thing. 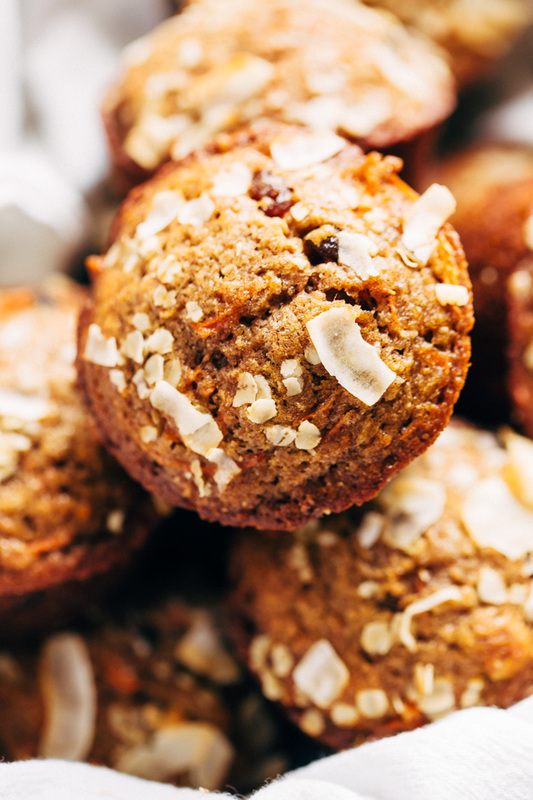 You’re packin’ these muffins with 2 cups of shredded carrots + tons of crunchy goodness and i’m telling you, they pair beautifully with a cup of coffee in the morning. These also freeze well so if it’s just you and the cat (or in my case, just me on the weekdays) pop them in the freezer in zip top bags and just zap them in the microwave when that 3 o’clock hunger strikes. Or when you roll of out bed 2 minutes before you need to be on your way to work. They work well in all sorts of sticky situations. Betcha can’t eat just one, it’s a good thing they’re good for you. Super moist and healthy carrot cake muffins are my jam! Position a rack in the center of the oven and preheat the oven to 350ºF. If you want, you can line your cupcake pan with paper liners. Or spray the insides with cooking spray. Sprinkle half the oats on the liners, set aside. In a medium bowl, sift together the flour(s), baking soda, cinnamon, ginger, and salt, set aside. In a large bowl with a whisk, hand mixer, or stand mixer, on medium speed, combine the brown sugar and oil. Beat in the yogurt and apple sauce until fully combined – about 1 minute. Mixture will be gritty and thin. Add the eggs, one at a time, beating well after each addition. Mix in the vanilla. With a spatula, manually stir the dry ingredients into the wet ingredients until just combined and all flour pockets are gone – do not overmix. 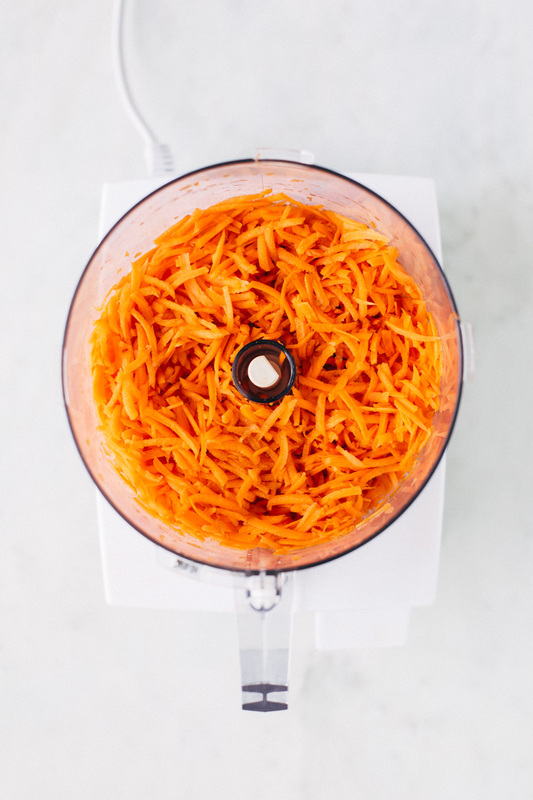 Fold in the finely shredded carrots, shredded coconut, raisins, and walnuts. The muffin mixture will be thick. Pour into prepared cupcake pans. Sprinkle the remaining oats on top and shaved coconut too if you’d like. Bake for 20 – 23 minutes or until a tooth pick inserted in the center comes out clean or with just a few crumbs. Let cool for several minutes before devouring! After making these muffins more than a dozen times after originally posting the recipe back in 2014, i’ve found that I prefer them with ⅔ cup of oil rather than the originally stated amount of ‘¾ cup’. However either amount will work. The original recipe also called for ‘½ tablespoon of cinnamon’ instead of the 2 teaspoons that i’ve updated it with. Nutritional facts are for 1/16th of the recipe using ⅔ cup coconut oil. these were perfect and super moist and fluffy. 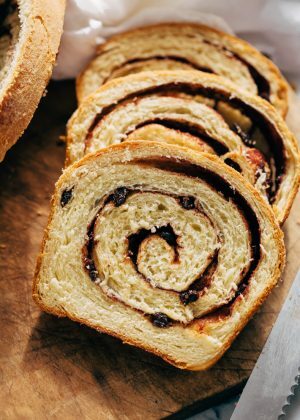 I replaced the flour with sprouted wheat flour and raisins with dried cranberries as i didnt have the other ingredients. Quite possibly the best muffin recipe I’ve used. They took a bit longer than expected to make but delish!! I saw the recipe clearly and indicates 3 large eggs. Hi I’m so excited to try this recipe but for some crazy reason, I cannot see the number of eggs this recipe requires. No one else’s review mentions anything about it. Can you help me, after all these years? These are so good. Love the oatmeal on top (didn’t use coconut). Made the look very professional. Will be making these again and again. Thanks for a great recipe. Love these muffins! And no, I can never eat just one! : ) Super easy to make and still come out moist after defrosting from the freezer when I make a large batch. I substituted canola oil for the coconut oil (cause it saved me a trip to the store) and found that the shredded cocounut gave it enough flavor. I found your recipe today and made these muffins. Wow, they are seriously fabulous! I didn’t have any coconut oil so I used half butter/half peanut oil to make it up to 2/3 cup. Thank you very much for the recipe, this one’s a keeper! Yum!! What a great way to serve carrot cake – as a muffin! I love it. Love these muffins! I used 2/3 cup of coconut oil and replaced the apple sauce with 1/2 cup purée fresh pineapple and walnuts with pecans. Big hit with everyone. While looking for a carrot cake muffin recipe I came across yours. After reading all the amazing reviews I can’t wait to make them. Very excited in anticipation. ? I’m just about to make these for my breakfast! How long do they usually last? Great recipe! 3 days at room temperature and a bit longer if you store them in the refridgerator. They’ll harden a little if stored that way, but a quick zap in the microwave makes them nice and fresh again! Hi there. My friend made me these muffins and i loved them only problem is i found after they had dairy in then and we don’t do dairy. What can we replace greek yogurt in the recipe for? Hi Valerie! Unfortunately, the recipe has only been tested as written so I’m unsure as to what would work. I did a quick google search and I’m seeing that softened or silken tofu often works well. 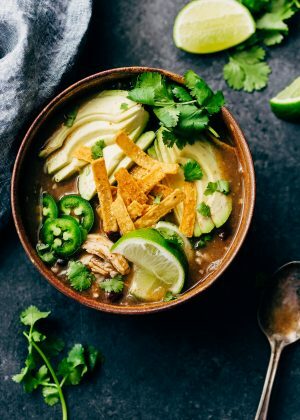 Not sure how it would work out in this recipe, but it’s an option if you’d like to try! I made them with canola oil. Will try coconut oil next time. PS: If you ever make a gluten-free version, i would love to try it. OMG! So good! They were devoured will definitely made these again. Super Moist is exactly the right name. These muffins aren’t in the least bit dry, plus it is made with healthy fats that are good for you. Omg I love this recipe, the base recipe you can use to make any other kind of muffins. I can say however, that I can cut back on the sugar next time, personal preference. Quick on the go breakfast or a afternoon snack with my coffee! Thank you so much! Would you mind coming up with a gluten free muffin too? These are very good muffins. I used apple/blueberry unsweetened applesauce as I did not have any regular applesauce. I also used canola oil in place of coconut oil as suggested. Thank you! Excellent recipe Marzia! My muffins turned out great. Thank you so much. 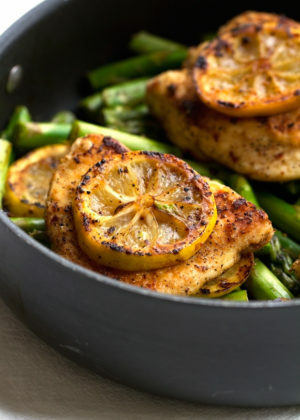 I love this recipe, but it seems to have disappeared from the page. Where did it go? Hi Karen, it’s back! We’re just moving recipes over into a new format! Thank you for a GREAT recipe! Made them again today. People LOVED them. Amazing! Used 1 cup whole wheat flour and 1 cup oatmeal flour. Did not have enough carrots, so used also a banana and an apple. Used only honey (less then 1 cup) and no sugar. Also, some maple syrup on top when they were ready, because I saw they needed a bit more “sweetness” and were a bit dry on the outside. Would love to see the changes! The original is great but way too high in calories for a little muffin. These are just so so good! I cut flour back to 1.5 c and used 1/2 c rolled oats in batter. Also added chopped dates and cut sugar back to 2/3 c. I’ll be making these again and again! Thank you! I just made these with sunflower oil, cranberries instead of raisins and chic chips instead of the nuts as they are for my daughter’s classmates for her birthday tomorrow. They are delicious! Thanks for the recipe, I’ll be making it again. Oh my, such a great recipe!!! Thanks!! Used the homemade Japanese Plum sauce instead of apple & extra carrots. Made a few extra because of the bulk so will share w/ neighbor who gave me the plums. Can i replace eggs with something else? I haven’t tested this recipe with anything other than eggs so I wouldn’t feel comfortable in suggesting replacements. 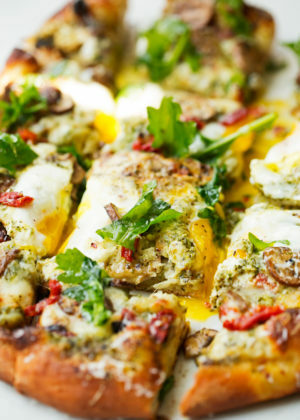 You Might try flax eggs as a substitute for the eggs. It’s flax seeds with a little water and let it sit for several minutes to conjeal. You can look it up on the internet to get the exact measurments. Many vegan recipes call for flax eggs. These are my go to carrot muffins. My kids love them. Thanks for a great recipe! Love hearing that they’re kid-approved! Thanks Carla! 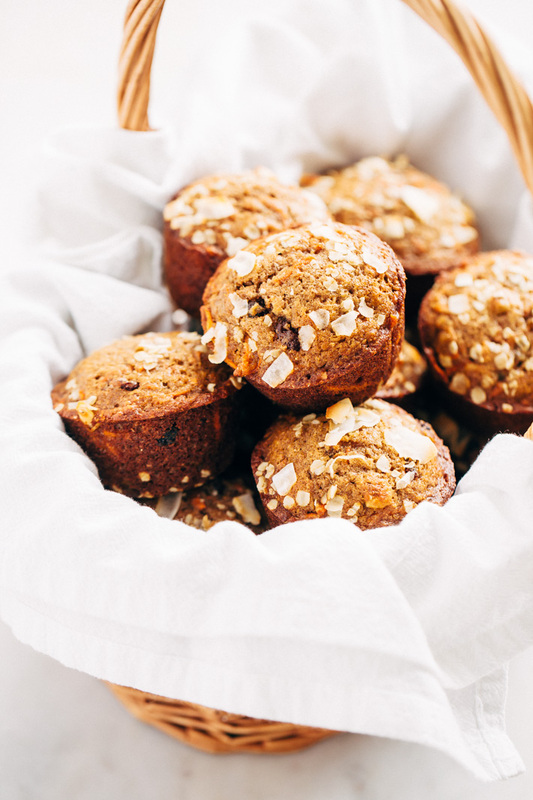 Just found and made these muffins today after googling for carrot cake muffins…. So delicious and moist! I made using 1 and 3/4 cups of whole wheat flour, and added an extra 2 tablespoons of apple sauce / yoghurt to ensure the WW flour didn’t dry them out too much. Also reduced the sugar to 1/2 cup as I don’t like muffins to be too sweet, and they have come out perfect. Highly recommended! I just made these muffins for my kids and husband and they LOVED them! My kids don’t like nuts or raisins in baking so I substituted with mini-semi-sweet chocolate chips and WOW! 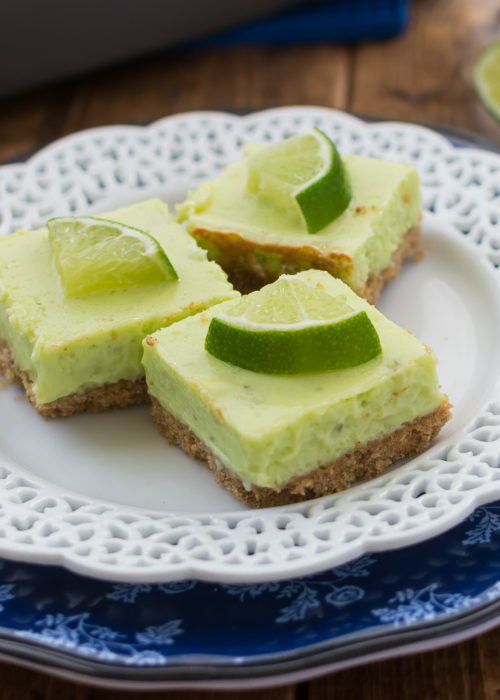 a healthy treat that meets the needs of even picky little eaters! thanks for this great recipe! btw, my little guy loved sprinkling the oats on the bottom of tops of the muffins….lovely touch! Just made these, halved the sugar and they are only delicious! I grated in a half cup of apple instead of the applesauce as had none and cooked for 18 minutes. Couldn’t wait for them tho come out of the oven! I wonder if you put some oats in instead of some of the flour say 1/2 cup blended oats would it be nice? Going to share these, thank you so much! I just finished baking these muffins today and they turned out to be super moist & delicious like you mentioned. I decided to omit apple sauce and used home made yogurt. Best muffins I’ve ever tasted. Thank you for sharing this receipe! Just tried the recipe, tastes great but every muffin hole has a puddle of coconut oil in it when I took them out of the pan. What a waste of an expensive ingredient. I’m going to try again some other time with less coconut oil. I put the coconut oil in the food processor with the other directed ingredients because I saw it wasn’t mixing well and I didn’t have any problems, they turned out really good! Did you forget to put the oatmeal in the bottom of each first? That happened to me, once, because I forgot it. I think the kernels of oatmeal help soak up any extra oil. Wow…. I found this recipe off a simple google search for muffins, and I am beyond pleased. These turned out AMAZING. I seriously underestimated how deliciously moist these cupcakes would really turn out to be without the use of butter. Now I wanna try the other recipes on your blog since this one turned out so well. Thank you so much!!! Mine turned out good except they were flat as flat muffins can be!!! What happened! Hmm. I haven’t heard of this happening before so i’m assuming it something as simple as your leavening may have expired? did you forget the baking soda? or salt? Hi. I want to try these. I am from Pakistan and we rarely use coconut oil in our cooking. Therefore I want to know, is it more healthy? thanks! There are numerous health benefits to using coconut oil in cooking. There is lots of research that shows that it can help reduce the risk of heart disease, benefits for the skin, aids in weight management, and also helps with immunity and digestion. If coconut oil isn’t easily available for you, you can replace it with canola oil, sunflower oil, etc. How many do you get in one batch? One batch makes 12-14 depending on how much you fill the muffin cups. Made these yesterday – delish! I too love the raw oats on the bottom and tops. I subbed craisins for the raisins and used unsweetened shredded coconut – the muffins were perfectly sweet enough. I added 2 T. ground flaxseed meal as I do with most baked goods. I didn’t melt the coconut oil since that wasn’t specified (just noted it in one of the comment replies) – worked fine. Since the recipe makes 16 muffins and I don’t like baking partial pans – I filled my 12 muffin pan and (1) 3″x5″ mini loaf pan – both delish and great texture – the loaf pan took an extra 10-12 mins. baking. Thanks Marzia! 2nd time I have made these awesome muffins 🙂 I Love this recipe!!! Yummy- I’m bringing them to my daughter’s 4th grade holiday party and to a Pot Luck too! Making my Holiday WAY more delicious and fun! Thank YOU! I don’t have apple sauce can I substitute with something else. Feroza, you can add an additional 1/2 cup of greek yogurt in it’s place. I haven’t tried this before myself but it should work. I will say though, that the flavor will be a little different than using the apple sauce. Wow! I got great reviews! My parents said they are they best things that I have ever baked! Haha. For some reason the carrots turned green by the next day. Is there anything I could do about that for next time? Thanks for the recipe! Oh wow! Glad to hear you guys enjoyed them. Hie!!! I am wanting to try these muffins Tomm. Such great reviews that just can’t wait. I have 2 queries. Would be great if you could please help. One, I don’t have Greek Yogurt. Can I use plain yogurt? Two, I don’t have applesauce :(. Any replacement for it??? Thanks a ton!! I could not find whole wheat flour from the grocery so I used APF all the way, total of 2 1/3 cups of APF. I also used vegetable oild instead of coconut oil. I also used almonds instead of walnuts. Well, it was a hit!!! My husband is not a muffin fan at all, but he loved every bit of it. Thanks for sharing this recipe. Hi. I can’t find any whole wheat flour in the grocery. How much should I use if I only have all purpose flour? Hi Allene, depending on where you are it may be called ‘wholemeal flour’. You can substitute all purpose flour if you’d like, replace the whole wheat flour with 1 cup + 2 tablespoons all purpose flour. So use a total of 2 cups + 2 tablespoons all purpose flour. Good luck! Just made the muffins & they are very good, the only problem is that they seem to be very greasy at the bottom. I used paper liners & when I took them out of the muffin tin there was alot of oil at the bottom. I put them on a paper towel to absorb some of it. Is that the way they are supposed to be? Hmm. I haven’t had that issue before. Did you use melted coconut oil? Thanks for replying, yes I melted the coconut oil in the microwave. Could it be that I didn’t put enough oatmeal at the bottom? Maybe that’s what normally absorbs the oil. Other than the oil issue, they taste great! 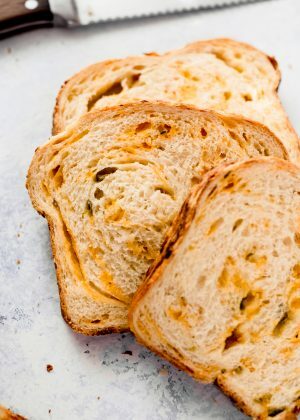 Thanks so much for taking the time to post this recipe, it turned out really great! I’ve used it twice so far, the first time I only had fat free vanilla yogurt and it tasted amazing anyway, they were really moist, and I only use that word when I really need to because I hate the word “moist”, haha. I also didn’t have ginger powder so I had to leave that out. I used 1/2 cup raw sugar and 1/4 cup honey, again partly because that’s what I had, and I also like baking that’s on the less sweet side. I particularly loved your tip of putting the oats on the bottom of the muffin tray and on the top, great idea that I’ve never seen before. I can’t remember where I saw this, but I read a great tip for melting coconut oil (I live in Canada so it’s liquid form in the jar in the summer months, but solidifies the rest of the year) – put the coconut oil in a glass jar and place it in a bowl of hot water, it turns into a liquid in just a few minutes. I’d always used the microwave before to turn it into liquid form, but I prefer not to use microwaves so I’ll be doing that from now on instead. As we know it’s always good to make sure your ingredients are room temperature when you’re baking, but especially so when you’re using coconut oil in a colder climate, I learned the hard way in the past by putting liquid coconut oil into cold ingredients and having it seize up right away, making it harder to blend. Anyway for the second batch I used 2% plain yogurt but left everything else the same, and I used half the batter for a cake and the other half for muffins, but then I gave them all away without trying that batch so can’t compare it to the first, oops. The cake got glowing reviews, though! 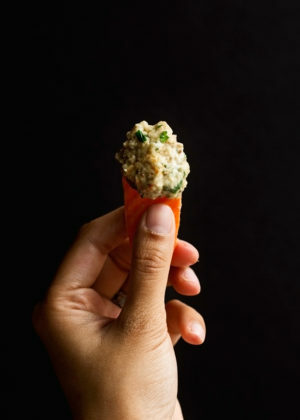 I happened across your recipe today while searching for “carrot breakfast muffins”. Happy find 🙂 Turned out perfectly and we have some for later this week … I think. (I left the kiddos alone in the kitchen with them!) Thank you for sharing, made our day! May I check whether the muffins will taste good without the sweetened coconut? I am unable to find shredded sweetened coconut. I was thinking is there anything i can substitute in place of the coconut. The muffins should taste fine without the sweetened coconut flakes. If you can find unsweetened coconut flakes, that should work just the same. If not, just simply omit it. It shouldn’t make a huge difference in taste. Seriously the best muffins I EVER tried! My whole family absolutely loved them! I have just seen this recipe. And I absolutely love, going to try it out tomorrow!!! I am crazy with this idea of adding almond milk and using only whole-wheat flower. Any advise? What a blessing the moist, healthy carrot cake muffins have been to our family! I can serve them to my 96 year old mother and know she’s getting good nutrition. They are perfect for my 32 year old daughter who “hates breakfast” but desperately needs to eat it. And my husband and I can put them along side our health drink for a breakfast that’s fast and healthy. Plus they are scrumptious. All good ingredients in an easy to take form. These muffins are fantastic! I doubled the recipe and used 1 cup coconut flour and pumpkin seeds instead of nuts for my 4 year old daughter to take to school. I also added 1/2 cup of powdered buttermilk and 2 tablespoons of flax/chia seed mix,and the greek yogurt was vanilla flavour. I will definitely be making these again!!! Mmmmm. Instead of 1c all purpose flour, can I just use 2 cups whole wheat flour?? Can I make without the ginger powder? Don’t have any but really want to make this! Yes absolutely! These muffins can be made without the ginger powder! 🙂 no worries go right ahead and make ’em! These are AMAZING!! Making my 3rd batch now in 2 weeks. My littles love them. I have made a batch in muffin top only pans so they think they are cookies 😉 Just baked at less time. THANK YOU!! That’s such a good idea! Love that the muffin top pan makes healthy ‘cookies’ for the kiddos! Thanks for commenting! These muffins were amazing! All 5 of my kids devoured them during after-school snack. Yay! So glad they’re kids approved! Thanks Maria! The best carrot muffins ever, thank you so much for sharing this recipe. Yay! That just makes me so happy! I don’t have Greek yogurt only strawberry what could I replace the yogurt with? I usually suggest regular yogurt in place of greek but since it’s strawberry flavored that you’ve got on hand, i’m not too sure how that would taste. You can use sour cream if you’ve got that on hand. You could also use 1/4 cup ripe mashed up avocado – I haven’t tried this myself but the yogurt is there to cut the oil back and the avocado serves the same purpose. I think it should work out just right. 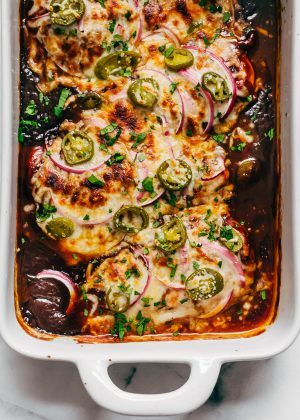 Seriously love this recipe. all time fav. whats the amount of sugar per muffin? They are so good! I am glad I found this recipe. I substituted 1cup of flour with milled oats, yummy! I brought my dear friend and neighbor, Jacy, Macadamia nuts from my recent trip to Hawaii. The next morning, she brought me these amazing muffins, straight from the oven…..using Macadamia nuts instead of walnuts. She also substituted garbanzo flour (yes, she has a grinder), which increased the protein, as well as made it a little less “gluten-ey” for those that have to watch such things. The two muffins I had were all I needed to eat for the rest of the afternoon! Absolutely fantastic! Thank you so much! 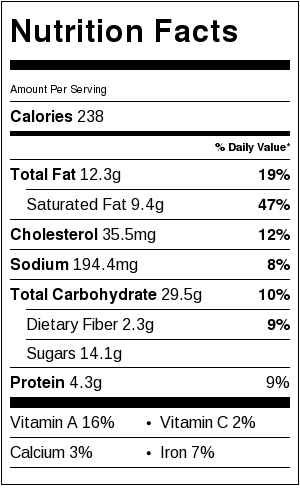 Did I miss where you share the nutrition information (I saw that one muffin is the serving size, but I’m looking for calorie count)? Wow, macadamia nuts sound like they would be absolutely amazing in these muffins! I hadn’t mentioned the nutritional fact for these muffins in the blog post, but i’ll list them for you below! Made these today and used 2/3 c red palm oil and 1/3 coconut oil. I added banana and nuts with some extra oatmeal in the mix. Sooooooo yummy! I will be posting this on my blog tomorrow. 🙂 I’ll give a shout out to ya! Wonderful, delicious healthy muffins, thanks so much for posting! I am eating more cocount oil, whole grains and veggies, so this is perfect! I substituted 1/2 cup 0-calorie sweetner and a few tablespoons of mollasses for the brown sugar and added more grated carrots instead of coconut. The oats are a nice touch, I like the crunch. Glad to hear they freeze well. Very good! I made them even healthier!. Replaced the all purpose flour with grounded oats and almond meal 70/30. Used olive oil instead of coconut (didnt have any). Sugar: 1/2 a cup and 1/4 of honey and took away 1 yolk. Sooooo good! I´ll be making these again today because my daughter has to bring bake good to school. Kids loved them! You are the best. If I dont have a mixer can I still make these? Of course you can! You can use a whisk where ever an electric mixer is called for. You will have to beat the ingredients for longer than the directions say but the results should be just the same! Happy baking! When you are blending the coconut oil with the sugar, is the coconut oil at room temperature and therefore hard? From Canada where room temperature is definitely solid coconut oil! The coconut oil should be in a liquid state. If it’s solid just measure out the 3/4 cup and zap it in the microwave for a few seconds until it becomes liquid. Remeasure the liquid oil and make sure to only use 3/4 cup before mixing with sugar! To Anne: I keep a smaller jar of coconut oil available which I can drop into a bowl of hot water to make it liquid. That’s what I did for these muffins. I live in Michigan so I know what you mean! That’s a great idea! I didn’t even think of that. This looks so good. I am so making this. Thank you. 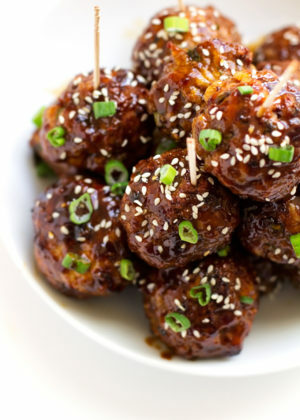 if I was to make these using a mini muffin pan, what would be the cooking time? The cooking time should be between 11-15 minutes. Start checking at 9 minutes. Insert a toothpick to see if it comes out clean. There should be a few crumbs on the toothpick but it shouldn’t have any wet batter on it. Hope this helps! These are awesome! I used pecans because it was what I had and separated my eggs, using only the whites but, other than that, I stayed true to the recipe. I love that they are lightly sweet and so very moist. I’ve shared on my Pinterest account and with several friends. Bravo! I’m so glad you enjoyed them Lisa! The pecans sound delicious! I am definitely going to try that out. And the egg whites are a great idea as well. That makes it so much healthier! 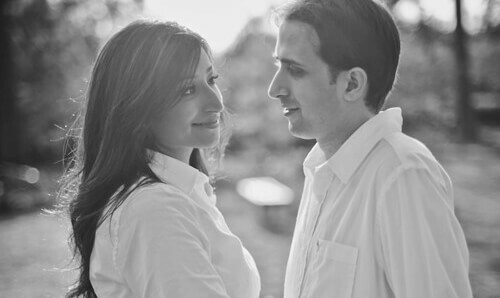 Thanks for sharing and all your kind words! These are so delicious! I just made them and they are so light and sweet! 10 out of 10! Thank you! I’m so glad you love them! Thanks for taking the time to comment and letting me know about your success! 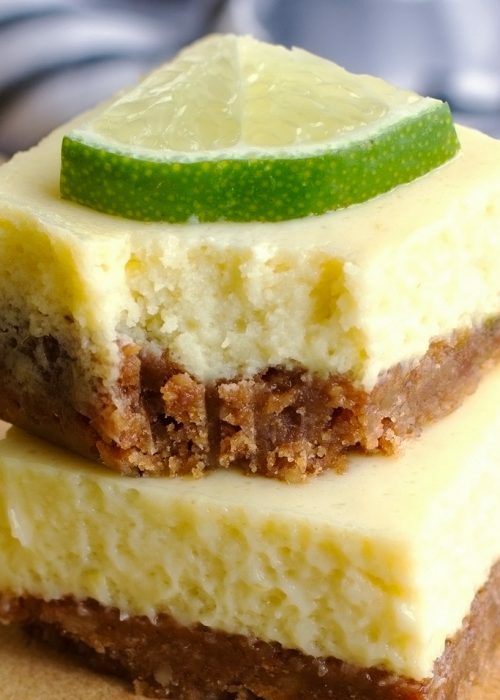 Just made these, awesome recipe…live how light they are. thanks. mmm, I made these yesterday to check if i wanted to have them for my birthday party on sunday! They are delicious and my family liked them a lot 🙂 I did change it up a bit though, i changed the sugar with natural raw honey and i changed half the coconut oil for apple sauce and for the the rest of the oil i used normal vegetable oil since i didn’t have coconut. Thanks for this recipe, it is delicious 😀 I am definitely making this for my birthday! These look perfect for this time of year, and for my non New Years Resolution (I’ll never keep actual resolutions!) to eat more creative breakfasts, because I’m usually terrible at feeding myself something real! Rachel, these muffins keep well in the freezer too! You can make a batch and store it. Simply defrost overnight on a plate or pop in the micro for about 20 -30 seconds!That way you’ve got them whenever you’d like! Happy baking!